Sarah is an award-winning writer of fiction and roleplaying games, including: the ENnie and Griffie Award-winning Mindjammer, the far future transhuman novel and complete standalone roleplaying game for the Fate Core system; Monsters & Magic, the old-school fantasy roleplaying game; The Chronicles of Future Earth, the upcoming science-fantasy setting for the Fate Core RPG; Burn Shift, the post-apocalyptic setting for Fate Core, the ENnie Award-winning “Zero Point” campaign for Achtung! Cthulhu; the “Great Game” campaign for Leagues of Adventure; and co-author of the Legends of Anglerre, FATE-based fantasy roleplaying game. 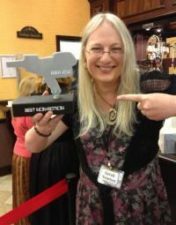 Sarah’s also the author of numerous short stories, and is ex-fiction editor of the BSFA Award-winning World Speculative Fiction Blog and the British Fantasy Society. In April 2017 her latest novel “The Worm Within” was published by Modiphius Entertainment / Mindjammer Press. In winter 2017, her Mindjammer RPG was published in French by Studio Deadcrows. She is currently running a Kickstarter campaign to publish the English-language version of the French RPG Capharnaum – The Tales of the Dragon Marked. She lives in rural France with her legendarily patient husband and Blues muso The Brown Dirt Cowboy, with an out-of-tune piano and numerous farmyard animals. 2PM Saturday in the Auditorium. She is also a part of the “Designing and Publishing a New Game” panel. 2PM to 3PM Sarah Newton. Keynote Address with Michael O'Brien 3PM to 4PM Art in Fantasy World Building. Helen Gordon, Delaney King, Alex Drummond 4PM to 5PM How to be a Better Player. Ben Scerri, Helen Gordon, Louise Leong Feature and Indie games, board games and vendors. 2PM to 3PM Mark Morrison 'Writing a Scenario'. 3PM to 4PM 'How to Become a GM'. Karl Brown, Artemis, Ben Byrne. 4PM to 5PM 'Designing and Publishing a New Game'. Sarah Newton, Vee Hendro, Wade Dyer. Feature and Indie games, board games and vendors.